These beautiful, tricolored potatoes. Oh my. They were so tiny and soft and pretty and I knew that I’d finally found the potatoes to make 101cookbooks smashed potatoes. It’s not so much a recipe as it is a way of cooking potatoes. Something about the color and texture (soft on the inside and crisp on the outside) is so perfect. Boil the potatoes in salt water until tender but not falling apart. Do not peel! Once done, drain and smash the potatoes carefully with a fork. Heat oil in a skillet and cook smashed potatoes until crisp on each side. Salt and pepper while cooking. Enjoy with an egg and a cup of coffee. Notes: I enjoyed the spicy seasoned salt on the potatoes. 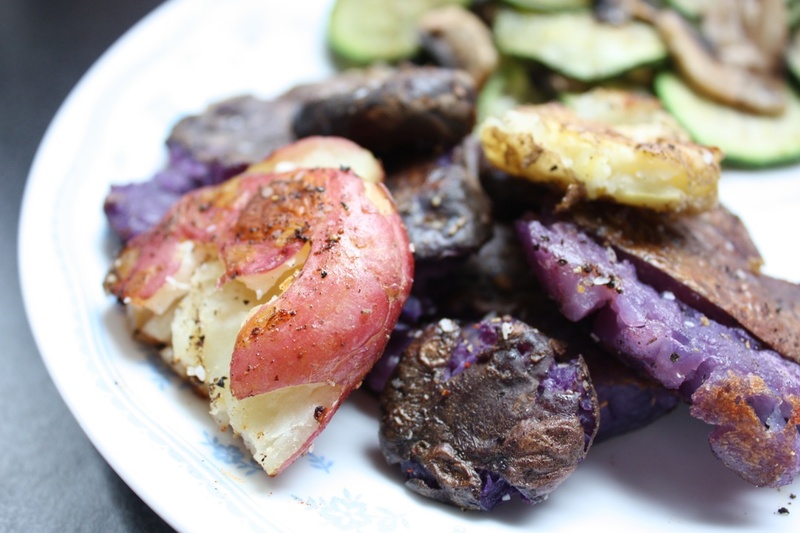 And of course, the color of the purple potatoes. We got some flavorful and crisp cucumbers in our CSA box a few weeks ago and I threw together this simple and tasty salad with some other ingredients I had on hand. 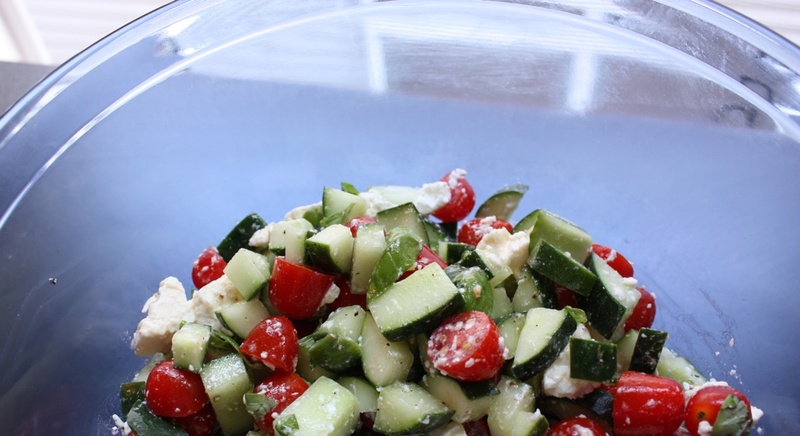 It makes for an easy summer salad on a hot day and looks pretty too. In a bowl, mix together all the ingredients and season with salt and pepper. That’s it! Your recipe is done! Notes: If possible, buy fresh feta cheese from the deli instead of the little plastic containers sold on a shelf. That stuff is so dried out it doesn’t really taste like feta anymore. Mmm. 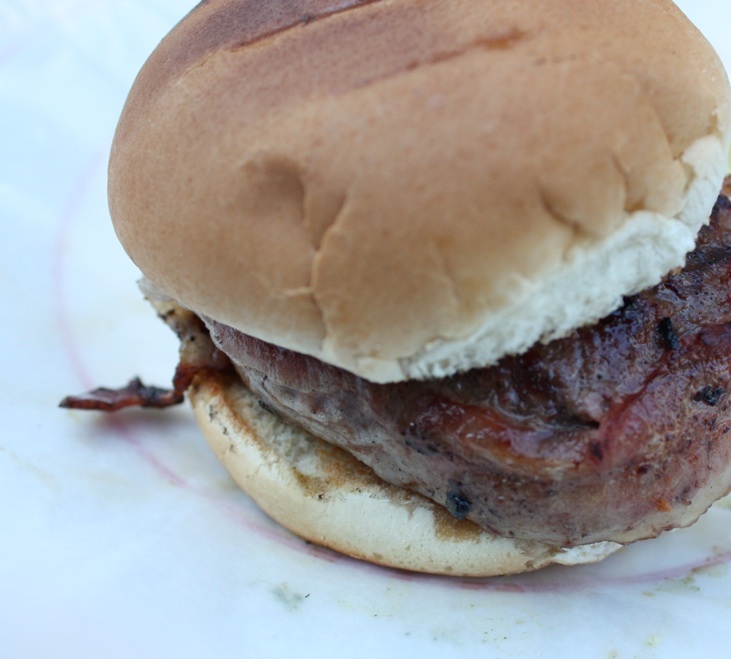 Bacon wrapped burgers. I walked into the kitchen while Kim was still preparing these hamburgers and wrapping them in bacon. I knew they would be awesome, and they were. In a bowl, mix together the cheeses, onion, egg, ketchup, Worcestershire sauce, salt and pepper. Crumble in the ground beef and mix together by hand. Form into 6 patties, and wrap a slice of bacon around each one. Secure bacon with toothpicks. Grill on a nice hot grill outside while enjoying some nice white wine or a home brew. Eat on a toasted bun. 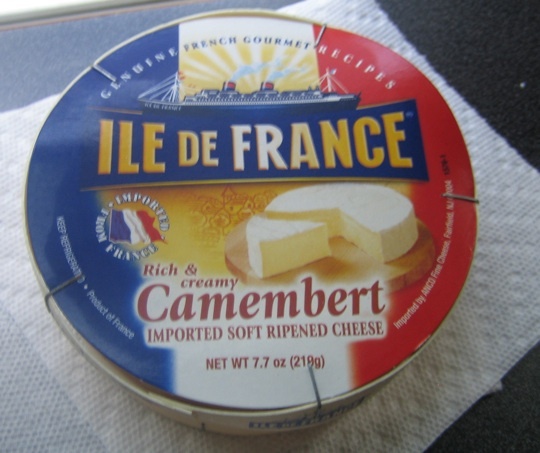 I got some cheese sent to me by Ile De France (*ahem* for free), and I have been eating it for a week. I selected the camembert cheese, a soft and creamy cheese. I’ve eaten this cheese on crackers, I’ve made a grilled cheese (! ), and I’ve put a few small pieces on a fried egg. While it’s no diet food, it is tasty. I finally looked for a recipe to use the rest of this cheese and came across this appetizer recipe on Epicurious. Preheat oven to 400. Roll out slightly thawed puff pastry on a floured counter top. Cut into either circles (or squares, which aren’t as pretty but much easier) and place on parchement paper on a cookie sheet. Here is where I forgot to brush them with the egg. Don’t forget! Dice the walnuts and mix with melted butter and salt. 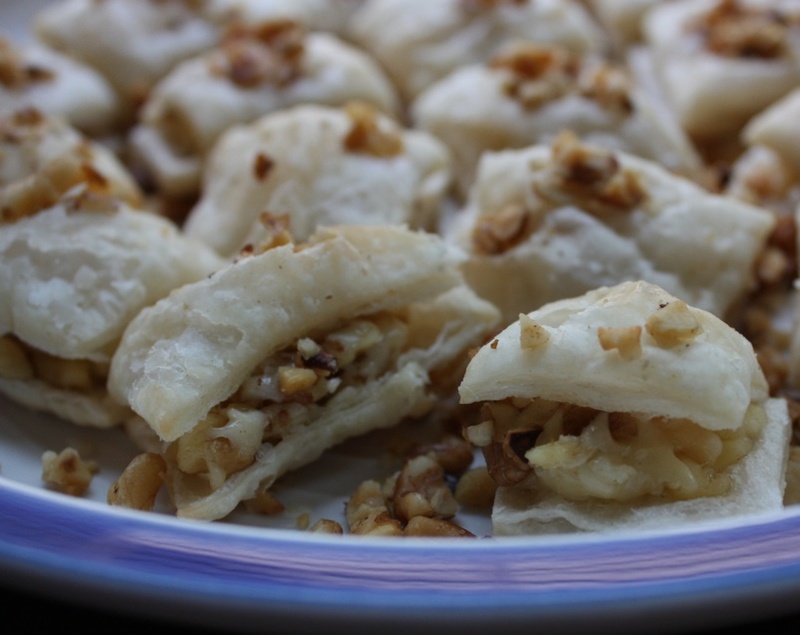 Top the pastry with walnut mixture and bake for 10-15 minutes or until lightly browned. While baking, mix together the camembert (with the rind cut off) and the walnuts. Once pastry is done. carefully pull apart each one so that there is a top and a bottom. Scoop some of the cheese and nut mixture onto the bottom piece and top with the other piece. EAT! This would also probably be great with a little honey drizzled on top, but my insulin dependant body thought that might be just a bit much. Notes: All the walnuts fell off. Oops. It still tasted great! Servings: 15ish. I forgot to count. We got a couple lovely little fennel in our CSA box and I wanted to something to really enjoy their flavor. I normally end up cooking fennel, but I thought I’d look for a raw salad with fruit, since it’s so hot and humid in our apartment. I ran across this and made a few adjustments. It was tasty! Slice the fennel very thin and clean thouroughly. Split into two bowls. Slice nectarine and split in two bowls along with the mint and shaved parm. Sprinkle with salt and pepper and top with lemon juice. Mix and serve. Notes: I forgot to put any olive oil on it, but it tasted so fresh and light this way that I’m not sure I would put it on anyway. 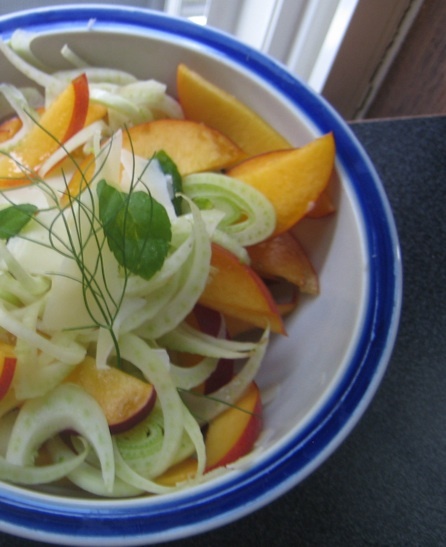 This was a great summer salad and could be presented in a much prettier way for guests. I live in an apartment and do not own my own grill. When summer comes around and all my food magazines are featuring grilled food, I start to get a little sad that I can’t make them. But this past year Chris bought me this grill pan for my birthday. I like it for many reasons. There are lots of grill pans out there. While I worked at the Chopping Block they always used these double burner, cast iron monsters. Did they grill well? Yes, they did! Could you ever get them clean afterwards? No. And they were heavy and crazy hot and I was always terrified of burning myself on one of those things in front of the entire class. Anyway, I knew I wanted a non-stick grill pan so that I could actually clean the thing and use it repeatedly. 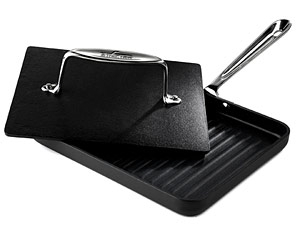 Another reason I like this is because it’s both a grill pan and a panini press (when you know how to use it). So, I can grill up some venison steaks one night using just the pan, clean it easily, and then use it the next night to make panini! The top press is heavy, made of cast iron I think (but it cleans easily). It took me a couple tries to get it to work correctly and brown both sides of the sandwich evenly. The trick is in heating both the grill and the press at the same time. The grill should heat at a medium to medium low temperature and the top press part should be on another burner with a high flame under it for a while, until it’s nice and hot. Then when you use it to press the sandwich, the press will have enough heat to continue cooking while the bottom part doesn’t burn. It’s actually much easier than I’m making it sound right now. 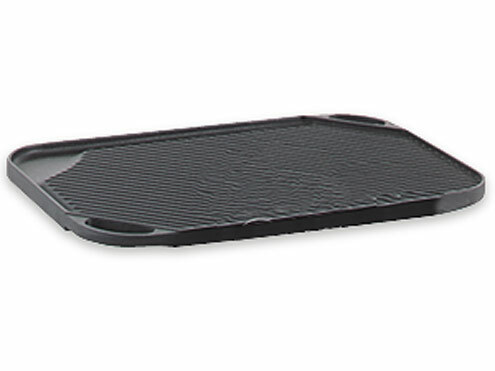 Are good grill pans and panini presses cheap? No. They aren’t. But I have gone through so much cheap kitchen cookware that I am no longer swayed by the higher price. I’d much rather pay more now and have this grill pan around for many years than to buy something half the price that either breaks in a year, doesn’t heat well or is covered in toxic material. What can you cook on a grill pan? We had an all vegetable meal tonight (sort of). 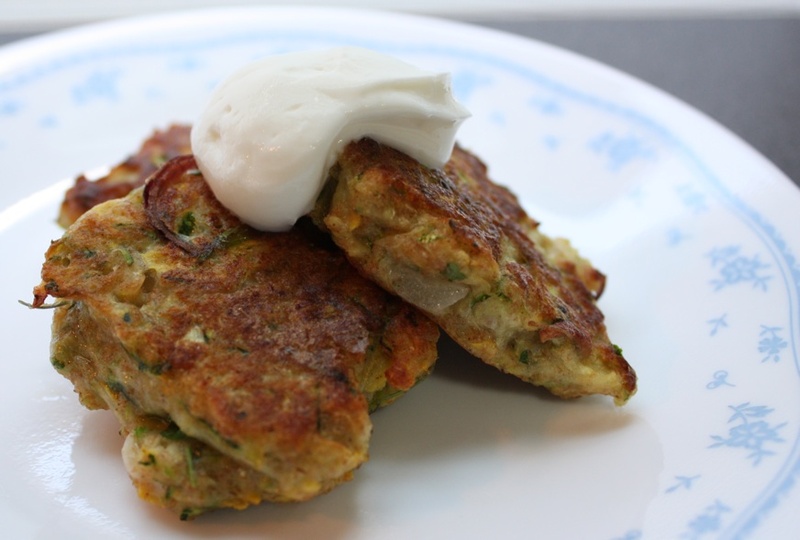 Miso soup made with vegetable broth and with spinach and onion, beet and kholrabi chips baked in the oven and these zucchini fritters with greek yogurt. Delicious, especially with the tangy yogurt. Shred zucchini and press out excess liquid with paper towels. Mix in the beaten egg, salt/pepper, flower, onion and herbs. Heat oil in a frying pan and drop in small amounts of the zucchini batter. Cook for 3-4 minutes on each side but watch to make sure not to burn. Set on a paper towel after they are cooked to get rid of some excess oil. Then serve with yogurt! Notes: Yum. Next time I think I’ll try baking them instead, as that is always healthier with less oil.